Racked is a first of its kind intantised branched chain amino acid complex, a unique intra-workout formulation created to push training further than you ever thought possible. Loaded with protein synthesizing iBCAA's, to help protect and grow lean muscle. Packing a powerful 2 grams of Acetyl L-Carnitine & L-Carnitine: which may help to cellularly metabolize stored fat in a fasted state, and convert your post workout meal for peak body composition. 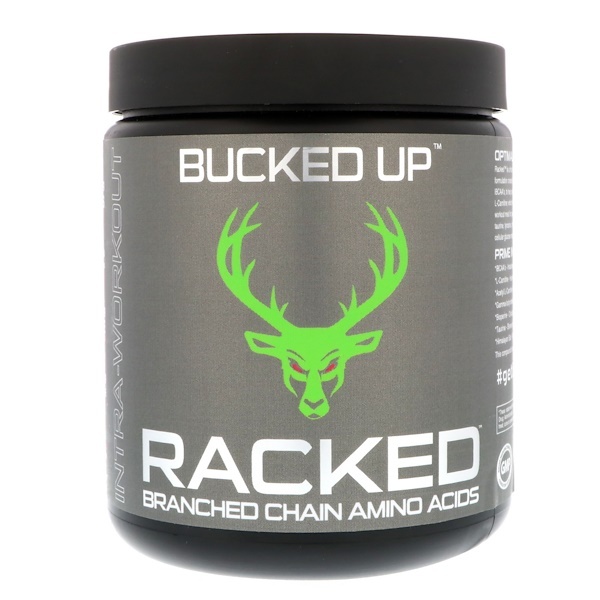 Racked, is synergistically rounded out with a potent punch of: taurine, tyrosine, chromium picolinate, Himalayan sea salt & Bioperine which may help ensure: hydration, cellular glucose metabolization, optimal thyroid function, precision focus, and clinical bioavailability. iBCAA's - Instantised to promote the cellular synthesizing of protein to protect & grow lean muscle. L-Carnitine - Has been shown to aid in the metabolization of nutrients from food. Acetyl L-Carnitine - May increase cellular fat metabolization in a fasted state. Gamma-butyrobetane HCL - Potentiates the natural production of carnitine in the body. 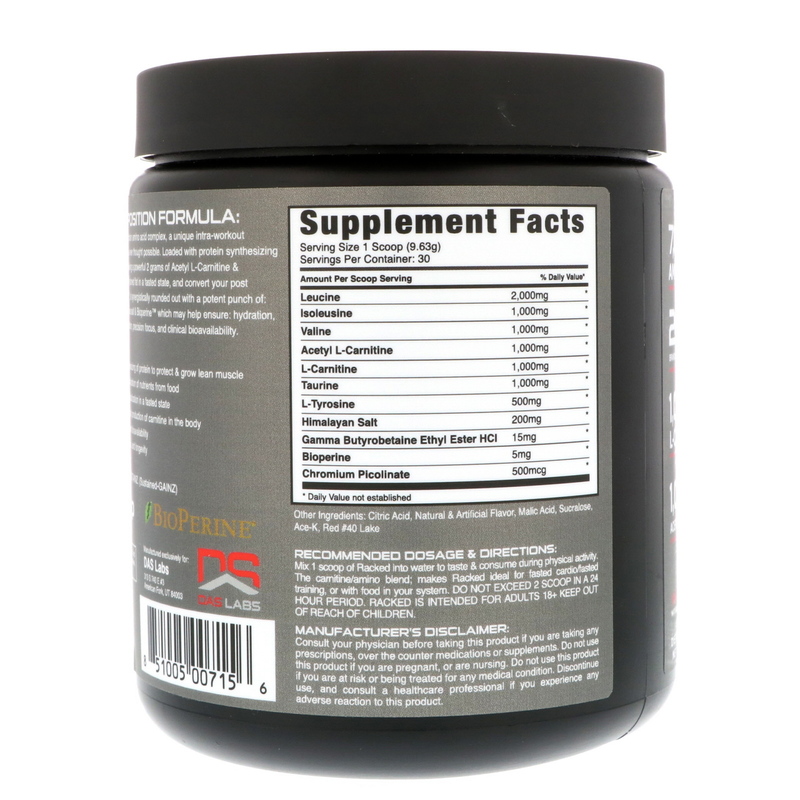 Bioperine - Clinically shown to increase supplement bioavailability. Taurine - Shown to promote glucose control, focus, and longevity. Himalayan Salt - Rich in 84 trace minerals. This compound's formulation ensures premium Sustainz (Sustainable-GAINZ). Mix 1 scoop of Racked into water to taste & consume during physical activity. The carnitine/amino blend: makes Racked ideal for fasted cardio/fasted training, or with food in your system. Do not exceed 2 scoops in a 24 hour period. Racked is intended for adults 18+. Consult your physician before taking this product if you are taking any prescriptions over the counter medications or supplements. Do not use this product if you are pregnant, or are nursing. Do not use this product if you are at risk or being treated for any medical condition. Discontinue use and consult a healthcare professional if you experience any adverse reaction to this product.